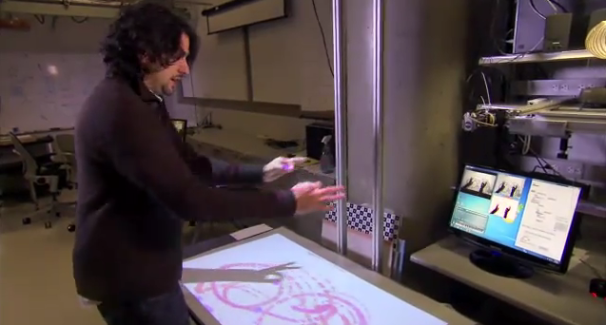 The future is here (well, sort of) with the latest in gesture technology from Microsoft. Not only could you soon be able to draw without ever touching the screen or a mouse, but the screen could follow your eyes to project a 3D image directly at you. Check out this video from Microsoft Research on YouTube as Microsoft's Applied Sciences director, Steven Batchiche, shows off the latest gesture tech. The gesture control you see is a projector facing down at a retroreflective screen which grabs the shadow from your hands (or any other object in the path of the light) and sends it back to the projector and then to the computer. From here, any movements you make are rendered into a drawing both on the PC's monitor and the retroreflective screen (by the projector). This allows you to draw without using a mouse or touching the screen. Bathiche also shows off some holographc technology that follows you whereever you go, a multiimage visual that gives different images for different people standing in different parts of the room, and re-rendering technology that changes based on where you stand with respect to the screen. James Mulroy is wondering when the alcohol cabinet will incorporate gesture technology so he won't have to mix his own drinks anymore.